In parts of this great country of ours you can spot bumper stickers that proclaim “God, Guns & Glory.” While I view this as, at best, the ultimate non sequitur, these themes all came together at the Hingham Bathing Beach last Saturday night. Really. And by the end, communion was served, a goose was dead, and a bunch of little kids were freaked out. Last year I started a monthly Saturday night family service at St. John’s. In cold weather we, naturally, worship in our beautiful church. 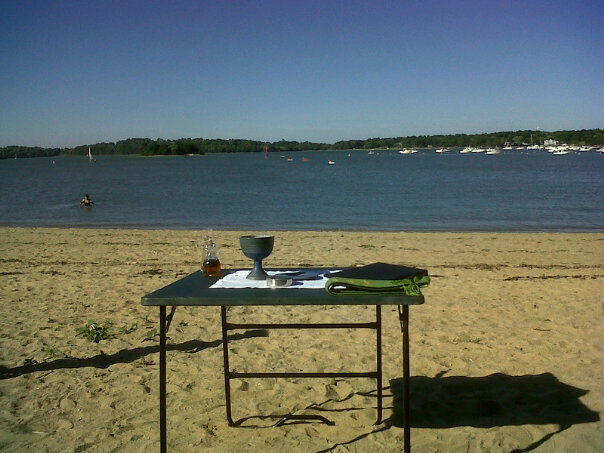 But I like to mix things up when it warms up so I’ve held “Mass on the Grass” in the Memorial Garden and on Saturday we had “Preach at the Beach.” If you can rhyme something with “eucharist” I’m all ears. As we were setting up I noticed a couple of guys about 50 feet away. They appeared to have poles of some sort and I thought they might be ready to go clamming. Another person thought they were preparing to set up canvases to paint the idyllic, peaceful, post card-like scene in front of them. 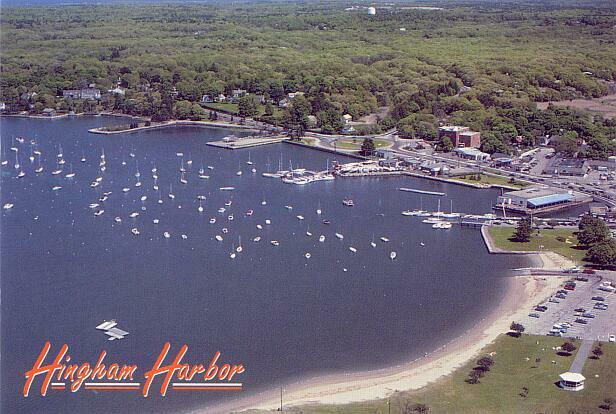 Hingham Harbor on a calm night is something to behold — you can see World’s End, boats bobbing up and down at their moorings, and several small islands dot the vista. But as I took a closer look I realized that these guys were toting not clam rakes but shotguns. When my curate walked up to inquire what they were doing — did I mention that I’m an excellent delegator? — she told them that we were about to have a church service with a bunch of young children and that we weren’t expecting a shootout. They replied that they weren’t expecting a church service and started placing decoys. As the service began, I kept a wary eye on our hunters. Fortunately it was a clear sky with nary a goose or duck in sight. The only thing out there was a kayaker or two and a guy paddling one of those standing surf boards that are suddenly all the rage. So the liturgy went off with the only thing needing to be reloaded were the communion wafers. Though I was pining for some bright orange vestments. But just as people were taking out there picnic dinners we looked up and saw three Canadian geese flying off the coastline. Suddenly a loud Bang! Bang! Bang! rang out in the quiet late summer sky. And then only two geese flew away while one fell wounded into the water. Our friends took a couple more shots but missed and the wounded goose swam away before, presumably, drowning. The adults were stunned; the children were horrified. Well, with the exception of my son Zack who yelled “Wow! 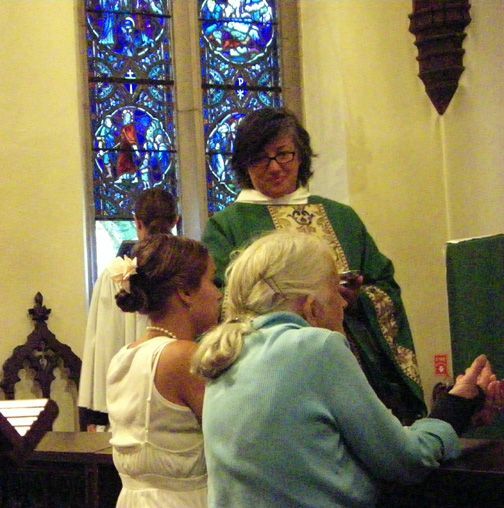 That was so cool!” One parent wondered whether it was open season on Episcopalians. We did call the police just to make sure they knew this was happening. An officer showed up, talked to the men, and left. Evidently this is legal. I guess he asked them to pack up given the circumstances which they grudgingly did, giving us dirty looks in the process. Now, I’m not opposed to hunting. I get the food chain thing. I’ve watched the Lion King way more times than I’m willing to admit so I understand the “Circle of Life.” But really? 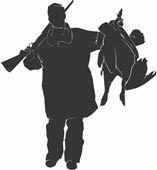 Hunting on a public beach? If this is indeed legal, then I think we need to examine the law. Regardless of whether there’s a church service (and we even had a permit to hold it), public beaches and firearms don’t mix well. It seems so obvious, I can’t believe I even have to state that. And thus parents had something else to talk about on the ride home; something they really hadn’t anticipated when they took their kids to church. In the aftermath, one little girl was overhead saying softly, “That’s so sad.” And she’s right. It is sad that children can’t be sheltered from violence at a beachside church service and it is sad that this was allowed to happen at all. The law needs to be changed before someone, besides a goose, gets hurt. Despite what you might have heard, it’s not true that Episcopalians are the only ones God trusts enough to take the summer off. Our churches remain open for business throughout the summer. It’s true! Don’t tell anyone though because we wouldn’t want to share the gospel of Jesus Christ with too many people. There’s no Sunday School. Actually, some churches hold informal one-room schoolhouses for kids that show up. This can be a nice way to keep children connected to God through the summer months. 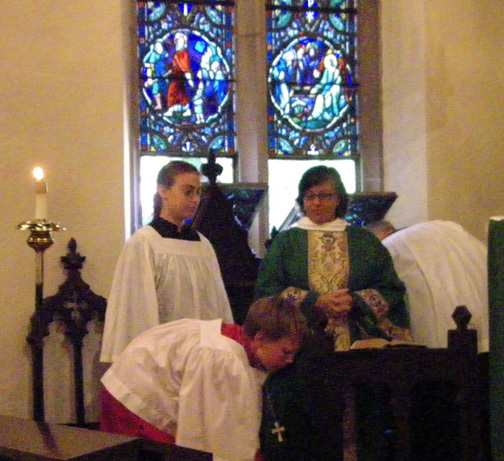 And if not, summer is a great time to get kids used to being in church – Sunday liturgy is the ultimate in Christian education anyway. The services are generally shorter and if they’re a bit wiggly no one cares. Do you really want SpongeBob to be their sole moral guide in July and August? It’s too hot inside the church. Sure some churches have air conditioning but not many. If you don’t have those fans you see in Baptist churches with the preacher’s face on one side and an ad for a funeral home on the other, you can always use the service bulletin. The upside is that you can feel free to dress down during the summer. And, remember, at least you don’t have to wear vestments! The service is too long. Maybe it just feels that way because of the heat (see number 2) but summer services are actually shorter. 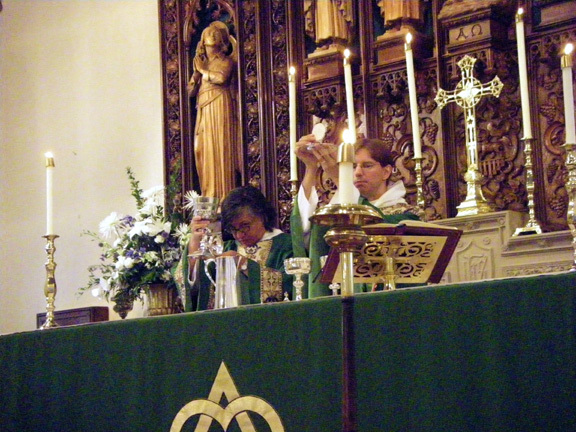 Fewer people means communion takes less time and many churches cut out some of the optional pieces of the liturgy. I’d rather be fishing. It’s true that the original apostles took fishing breaks in the Sea of Galilee. That’s what they did for a living, after all. But they also balanced this out with regular times of prayer. Jesus wouldn’t have it any other way. The music’s not as good. No, the full choir isn’t around in the summer but some churches have all-volunteer summer choirs. If you love to sing but can’t commit to the regular rehearsals, this is your chance to be part of the show! 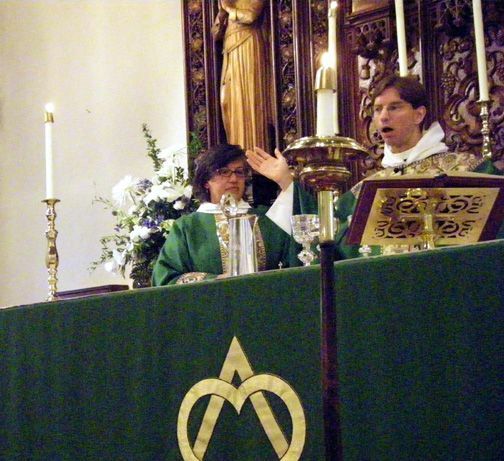 Plus, clergy and organists tend to program popular, singable hymns in the summer months. The old warhorses rule. Early tee time? No problem! That’s why God invented the 8 o’clock service. I’m in New Hampshire/The Vineyard/The Cape. Fine. Go to church out there, enjoy worship in a different style, bring back the bulletin, and hand it to a member of the worship committee. Fill-in clergy are boring. That’s not true – generally. Sure the rector may be on vacation (some parishioners live for this!) but if you know any inspiring retired or bi-vocational clergy, let your priest know. We’re always looking for good help when we’re away. Of course I once had a veteran priest tell me that the key to hiring supply clergy is to find the worst preacher you can get because the congregation will be thrilled when you return. So there you go. There are no more excuses. Go to church this Sunday wherever you may be. You’ll be better for it and you’ll find summertime to be an even more fruitful and enjoyable time of year. But the reason I like to hold services outside is to make the point that while the church might be God’s House, God is not under house arrest. God is much bigger than even the most sacred space. The incarnational nature of Jesus cannot be contained within four walls. Even four wall that have a bunch of Tiffany windows. Some of the most memorable liturgical moments can happen outside church buildings. Many have had profound spiritual experiences at off-site parish retreats, camp sites, or house blessings. One of the beauties of a house blessing, for example, is that it indelibly turns a home into sacred space. It is a place of daily routine and the very essence of everyday life but it is also a place of prayer, a place where humanity continually reaches out for relationship with the divine. A service in a church courtyard or in a city square or on a lakefront or in a forest preserve does much the same thing. It shatters the false barrier that exists between the sacred and the secular, reminding us again that there is no secular world. 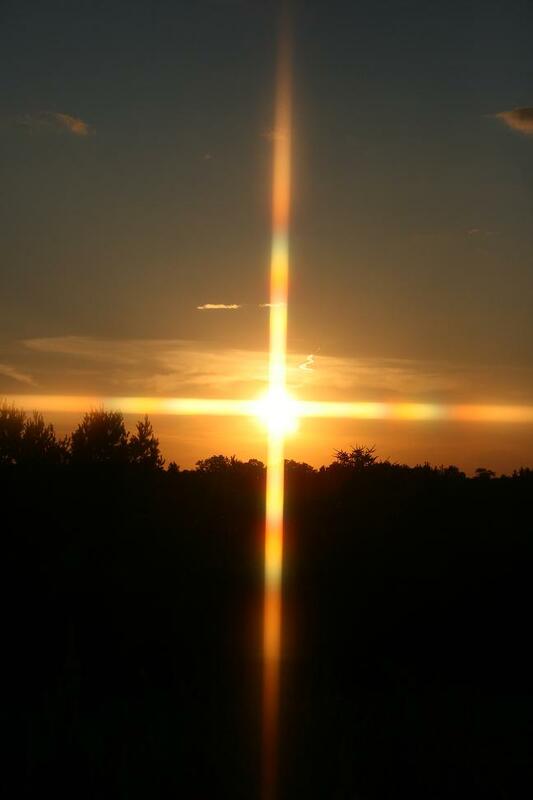 It is all sacred because it is all created at God’s hand. So on this first day of summer, here’s a radical idea: don’t go to church! Or at least go to church outside your church building. Look for an outdoor eucharist or encourage your priest to offer liturgy outside. I highly recommend it and this is the perfect time of year to get out of our liturgical boxes. And if you can find something that rhymes with “eucharist,” I’m all ears.